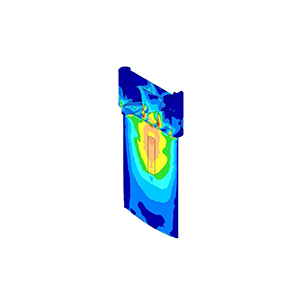 FEA-Solutions (UK) Ltd - Finite Element Analysis For Your Product Design | 175: Lifting Keel for Superyacht Stress analysis of lifting keel for sailing yacht subjected to lateral and grounding loads. FEA run on six different designs with the aim to reduce weight and cost. Final cost savings 15 times more than the FEA cost. Stress analysis of lifting keel for sailing yacht subjected to lateral and grounding loads. FEA run on six different designs with the aim to reduce weight and cost. Final cost savings 15 times more than the FEA cost.